SPRINGFIELD – At LGBT Advocacy Day on Wednesday in the State Capitol, Equality Illinois, its partner organizations, and citizens from across the state called on the General Assembly and Gov. Bruce Rauner to approve legislation protecting LGBT youth from dangerous and ineffective conversion therapy and adopt a responsible budget that protects vital services for Illinois workers, families, children, seniors, immigrants, and other residents. Partnering with the Center on Halsted, Phoenix Center of Springfield, and New Hope Recovery Center, Equality Illinois hosted and organized today’s LGBT Advocacy Day at the State Capitol. Citizen advocates from across Illinois today are meeting with their legislators to pass House Bill 217, which protects LGBT youth from harmful, discredited conversion therapy, and ensure a budget plan that protects vital services for Illinoisans. 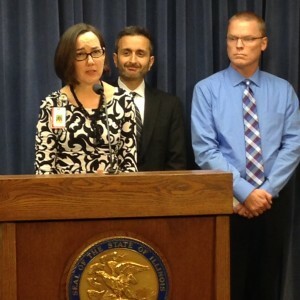 At a morning press conference, Cherkasov was joined by Rep. Kelly Cassidy, chief sponsor of HB 217, the Youth Mental Health Protection Act; Jeff Zacharias, President and Clinical Director, New Hope Recovery Center, Chicago; Ramon Gardenhire, Vice President of Policy at the AIDS Foundation of Chicago; Rev. Jamie Frazier, Senior Pastor, Lighthouse Church of Chicago, and Curtis Galloway, a college student who survived an attempt at conversion therapy. They called upon the General Assembly and Gov. Rauner to approve House Bill 217 and adopt a responsible budget that ensures adequate revenues, supports shared priorities, and makes smart investments in Illinoisans. Equality Illinois, the state’s oldest and largest advocacy organization for LGBT Illinoisans, is a member of the Responsible Budget Coalition, a large and diverse coalition of 150 organizations united to preserve vital services for Illinoisans. The Coalition focuses on three common principles: ensure adequate revenue to support state priorities and make smart investments, make no more cuts to services, and establish fairness in revenue sharing and cuts caused by failure to raise adequate revenue. Equality Illinois outlined several of the dramatic cuts it opposes in the proposed Fiscal Year 2016 budget. Immigrant Integration Services: These services are wiped out by the proposed budget. The program provides critical assistance to many LGBT immigrants seeking asylum in the United States or potentially to marry a partner. Advocates also urged lawmakers to approve House Bill 217, which protects the mental and physical health of LGBT youth from harmful, discredited conversion therapy that coercively seeks to change their sexual orientation or gender identity. Equality Illinois has made passage of this bill a priority during the spring session. The legislation, which is sponsored by Rep. Cassidy and Sen. Daniel Biss, awaits consideration by the Illinois House of Representatives after passing the House Juvenile Justice and System-Involved Youth Committee last month. The practice of conversion therapy has been thoroughly discredited and rejected by the major medical and mental health organizations in the United States. Recently, such Illinois-based organizations released a strong statement of support for HB 217, calling on the General Assembly and Gov. Rauner to protect the physical and mental health of LGBT youth from conversion therapy. These organizations said that conversion therapy has no scientific foundation and is harmful to LGBT youth. Rejected or socially stigmatized LGBT youth are more likely than their peers to attempt suicide, have high levels of depression, and engage in substance abuse and risky sexual behavior. Their statement is here. Last week, President Barack Obama and Surgeon General Vivek H. Murthy announced their support for such legislation as HB 217. “As part of our dedication to protecting America’s youth, this Administration supports efforts to ban the use of conversion therapy for minors,” the White House said.